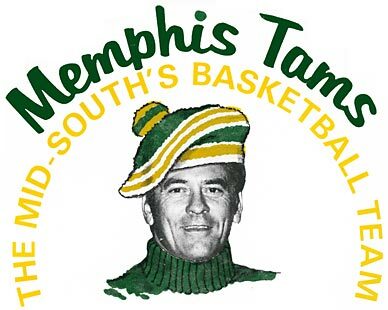 In 1972, the Memphis Tams became the most "colorful" team in the ABA. At their first home game, all of the Tams and Coach Bob Bass (above left) pranced onto the court wearing white, green, and gold tams (hats) on their heads. The players' uniforms were also a sight to behold. 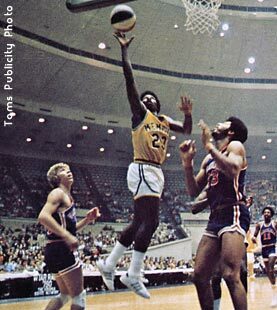 The Tams had green, gold, and white tops, plus green, gold, and white shorts. The Tams wore these colors in all possible combinations. Some of the combinations were unbearably ugly--for example, at home the Tams sometimes wore their gold tops with their white shorts (above right). On the road, it was even worse when the Tams wore their green shirts with their white shorts.